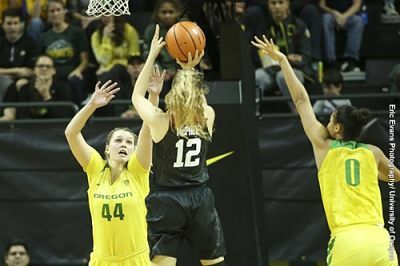 Brittany McPhee’s second-half scoring barrage paced Stanford over Oregon. Photo by Eric Evans Photography/Oregon Athletics. Eugene – Ruthy Hebard jumped up to rebound a shot she thought was an airball by Stanford’s Brittany McPhee, except it wasn’t. The step back three-pointer that McPhee shot glided cleanly through the net. The Cardinal’s leading scorer put up a career-high 33 points on 14-of-22 shooting – including 3-of-5 from beyond the arc – with 31 of those points coming in the second half. No. 6 Oregon had no answer for her, and No. 24 Stanford upset the Ducks, 78-65, and pulled even with them atop the Pac-12 standings. It was Oregon’s first home loss of the season. Kiana Williams and Alanna Smith each added 14 points for the visitors. 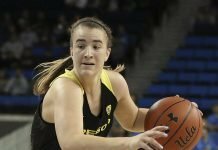 Sabrina Ionescu led the Ducks with 22 points, while Hebard had 16 and Satou Sabally, 14. Cardinal coach Tara VanDerveer said McPhee willed the team to the win. The senior said the win was a team effort. Duck coach Kelly Graves had high praise for McPhee. In the last two quarters, McPhee had 31 points on 13-of-18 from the field. 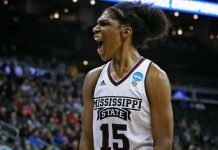 McPhee got into the lane and ran off screens to get herself free looks at that basket. She said she was determined to score more after only having one basket at halftime. 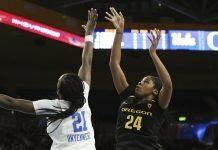 Defensively, in the second half, Oregon gave up 46 points on 56 percent shooting and scored only 24 points on 28 percent shooting from the field. Graves said his team was on their heels the entirety of the second half. Turnovers also hurt the Ducks, as they had 15 in the last two periods while the Cardinal had only six. Oregon will look to bounce back on the road, as they travel to Washington next weekend. “We’re going to let this hurt a little bit, but tomorrow we’re going to come into practice and get ready for the Washington schools,” Ionescu said. The Ducks had sole possession of first place in conference standings going into the matchup. If UCLA beats USC Monday night, they will tie with the two teams for first.